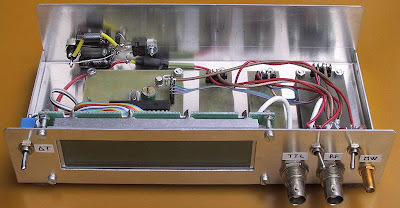 This RF/Microwave Frequency Counter project built based on PIC 16F876A. The basic counter rate is extended to at least 180MHz using two 74Fxx devices. A divide-by-64 prescaler is used for higher frequencies up to at least 4.5GHz. All results of the measurement are shown on an inexpensive, 2x16 alphanumeric LCD module with large characters. There are 3 inpust on this project a microwave (prescaled) input, an RF input and a TTL input. The microwave and RF inputs are AC coupled and terminated to a low impedance (around 50ohms). The TTL input is DC coupled and has a high input impedance. A progress-bar indicator is provided on the LCD for the gate timing. Both the microwave and RF inputs have an additional feature : a simple signal-level detector driving yet another bar indicator on the LCD module. This is very useful to check for the correct input-signal level as well as an indicator for circuit tuning or absorption-wave-meter dip display (Lecher wires). This project designed by Matjaz Vidmar.